At VGC International College’s School of English Language, we are proud of our academic reputation. We have earned this through our exceptional teaching staff, well-designed English courses and personal attention to our students. All of our students take a placement test upon arrival at VGC, to ensure that they are assigned to classes that are suitable for their needs and goals. We follow our students’ progress carefully by counselling, guiding and helping them to achieve their language objectives. Our integrated approach allows our students to learn English in a more natural manner. We focus on proven methods that bring results efficiently and effectively. 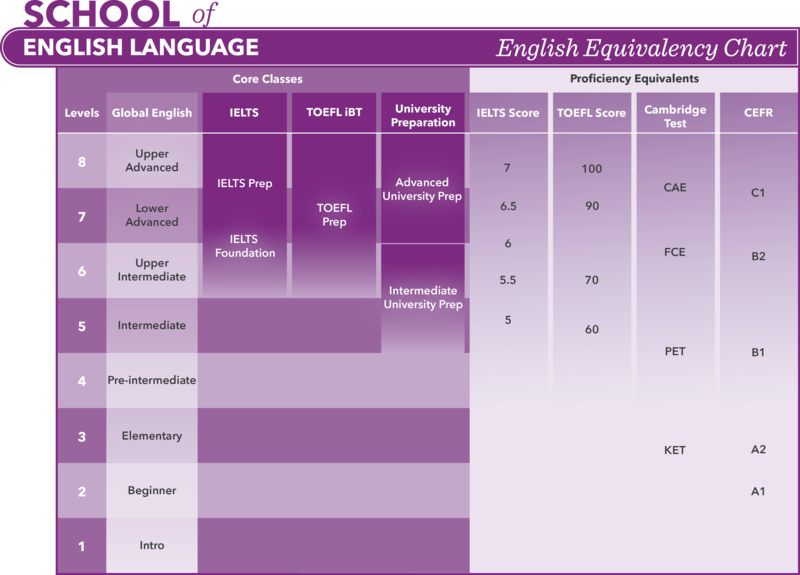 All VGC levels are based on the Common European Framework of Reference (CEFR) and have equivalent band scores for the IELTS Exam, TOEFL Exam and Cambridge Exams. This allows our students to have a full understanding of where they are in relation to all major international standards. We are particularly proud of our teachers who work very hard to maintain an extremely high standard in the classroom while remaining friendly and approachable. We look forward to having you join us on your English language learning adventure. To ensure student objectives are met, each student receives a student folder where each student’s work and progress is collected.